Home > Casino news > Articles > Is Gambling Research Really All That Useful? Many studies with regards to gaming and the public’s desire for doing so have been written over the years. The gambling research that has come about suggests that people are certainly looking to find more ways to play casino games. But the real truth is that there are far too many issues abound with regards to these studies. Such reports are not necessarily as useful or beneficial as many people might think they could be. If anything, the research that is being done on gambling in many cases is actually misleading. The data might be heavily biased because of the funding that comes along in many studies. Such studies make it harder for people to trust in some bits of data. Of course, this is provided that people fully understand where the funding comes from and how many people are heavily influenced by others to complete certain tasks. Many of the organizations responsible for gambling research projects are often taking in money from those in the casino and gaming industries. This money is often taken as a means of funding a variety of projects. Sometimes those projects might be outside the realm of the issue. As a result, some of these projects may be skewed in favor of the casino industry. They might be told to adjust some numbers to make them more favorable to those who want to build such places for gaming. They do this with the intention of getting more money. This makes it so some research documents may be heavily biased. These biases can become very significant over time depending on how they are organized and used. The costs that come with individual projects can be varied. Some of them cost millions of dollars due to the need to contact individual people, travel to many places and figure out how much information is involved. The manpower used to get such a project ready can also be a factor. All of these points will directly influence what people might expect to spend on such projects and can end up directly influencing such plans in a number of ways. As the costs start to grow, it becomes harder for people to get support. This makes it difficult and hard for people to complete some projects. Added funding is needed to make it easier for businesses to grow. There is always a need to look around to see how well funds can be found. For some people, it becomes increasingly easy for different projects to work in some ways. Studies are especially problematic in the United States (US casinos here). It is estimated that funding for projects in the United States is about one-twentieth that of what similar groups in Australia and Canada receive. This means that such groups are often going to resort to taking in funds from suggestive groups. Sometimes the money is used to get access to specific documents or reports. But these are also pieces of data prepared by the groups that want to look good. They are essentially influencing the reporting so whatever they get into isn’t too hard to handle. Many individual sites for gaming might help with supporting some studies. These include places that already have millions of dollars on hand. They often claim to support such reports because they want to show that these places are socially responsible. Individual organizations that run much of the industry also provide assistance. The Responsible Gaming Trust, one of the largest organizations of entities in the field of gambling, has been known to offer its support to a wide variety of projects. Retail industries may also be involved with keeping some aspects of these plans afloat. Such industries are dedicated to supporting a variety of research tasks in that they are aiming to help people learn more about what they can do in terms of a variety of basic functions. Funds are always found through a number of independent donors. Still, such funds might come from people who are directly linked to casinos and other places for betting and transactions. They might want to look positive in some of these reports. This becomes a real threat in terms of what people can do with it. The funding sources for such projects can be varied. These are all still places that benefit from those who place bets and enjoy all kinds of games of chance. The greatest concern is that some people responsible for carrying out projects might be too fearful. They might not want to complete the tasks that they were told to finish. This comes as they are often worried about what might occur when trying to complete certain documents or reports. Some are fully aware of where they are getting the funds for their projects from. As a result, they are not all that willing to follow through on some tasks. They might argue that if they continue to work on them that they will be complicit in supporting certain groups. These include those who are trying to influence a project to go in one particular direction. This sense of integrity is admirable. Still, it is an issue that often keeps people from willing to continue to work on certain tasks. They are fearful of what might happen if they step out of line and not do things as they are supposed to. As a result, they are willing to step away from some projects and get out of them. This weakens the overall projects that people enter into. 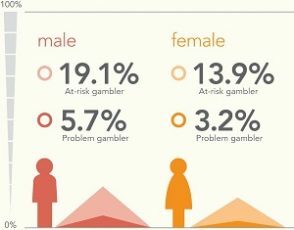 The general public needs to have a sense of concern over gambling research. There is no real reason as to why people should be fully trusting of the reports that they read. The influence that comes from other groups can really be a problem that will directly impact any analysis.